Item Number: 266-7-11328 19616 Actual Weight: 0.1 lb. Frameless, lightweight protective eyewear has wraparound coverage, polycarbonate construction, and hard-coated, scratch-resistant lenses. 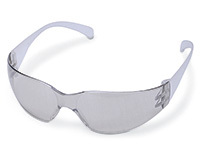 Mirrored polycarbonate lenses absorb 99.9% UV. Meets the high impact requirements of ANSI Z87.1-2003. Designed for indoor and outdoor use.